An Apology, An Update, and TTD 2016! UPDATE: I've returned from Teach Them Diligently 2016 and it was wonderful. I discovered something that I think might be the holy grail for Jacob in his schooling. Look for a Skrafty review coming very soon. Many fun updates and reviews coming soon. I promise this time. First I want to apologize, again, for hardly ever posting. There have been many many changes in our family and our homeschool over the last few years. I'd like to give everyone an update on what's going on with our family. I am still homeschooling our younger son but our older son started public school in the middle of his 8th grade year. He's finishing up 10th grade this year. Let me explain a bit about why we felt that our older son would be better served not homeschooling. I feel I need to be honest here and tell you that even my son will tell you that he made life incredibly difficult for me every day of homeschooling. From a small small boy he never even wanted me to read aloud to him. He bucked any thing he perceived as school and dug his heels in and did everything possible to avoid school work of any kind. This includes being read aloud to. Because of his disdain for all things school I delayed Kindergarten with him until he was 6. This began the all out war that was learning to read. I spent the next several years seeking out any and all help in phonics because I was more and more concerned that he had a learning disability. Now that he's reached high school and has been tested a few years on reading comprehension and other things we know that basically he can read and comprehend anything he wants including things written at a college level or above. 99% of the issues he had with learning to read were nothing more than the simple fact that he had no desire at all to learn. He still does not read books for any kind of pleasure. He reads to find the information he needs. That's all. For this mama who reads voraciously I was heart broken much of the early years of his education. I'll be honest again and tell you that I spent many hours in deep talks with Jesus about putting him in public school. My relationship with Jesus grew in ways I never knew could be possible. I learned to trust Him more than I ever had and more than that, I learned to release my son into Jesus' hands every day, every hour, every minute. If I hadn't come to the place that I could do that I would have lost my mind. I was a lifer with homeschooling, meaning I would homeschool both boys all the way through high school. At that point I'd never done anything so hard as enroll my son in public school. It was the death of every dream I had for his schooling and his life. It was crushing to put it bluntly. I made it through the day each day by reminding myself many times a day that Jesus hasn't left my son and He was still watching over him. It's the only peace I had during that time. Here we are 2.5 years later and he's doing well. He's about to turn 17 in May and he has his struggles as we all do but over all he's doing ok and Jesus still watches over him every day, every hour, and every minute. Jesus is faithful no matter what! Our younger son is still at home with me. It was a big adjustment for him not having his brother with him every day but he's adjusted well. This past November I was able to get a job working at home with Amazon doing customer service. It was a big adjustment but we are settling in fairly good now. The work has been a huge financial blessing for us. You can't put a price on being able to work from home either. We used several curricula over the last 2 years for our younger son. I've still mainly stuck with my favorites which are Heart of Dakota, BJU, and All About Reading and All About Spelling. I've been so spoiled with AAR and AAS I've had a tough time finding an elementary grammar that I liked. We recently started Easy Grammar and it's working out fabulously for us. I'm so pleased I'll be buying the next level at Teach Them Diligently this week! I've not made final plans for next year on curricula for our younger son yet but I will post with our final decisions when they are made. Speaking of Teach Them Diligently I am so excited to be going again for the 4th year, I think, this year. With me working now and Jacob starting 5th grade next year we need to shift to more independent work in some subjects. I've got plans to spend a good amount of time at the Christian Light booth. I'm spending some time reviewing Mystery of History as well. My main subjects that need decisions are math, history, and reading, I'll be spending more time in the vendor hall this year and buying more speaker sessions to listen to after. I'm very excited! I'll being trying to post a bit for this years convention as well. So much fun stuff to do and see. Teach Them Diligently 2016 Convention Registration! 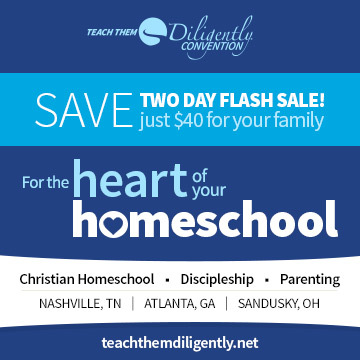 Teach Them Diligently Convention is now registering for their 2016 Conventions. As an added bonus if you register during this flash sale that gives you registration at half off you will also be entered to win a 2 night stay at the on site hotel for your chosen location registration. I can't recommend these conventions enough. I am blessed beyond measure every year I attend. Just click on the picture to register. I attend the Nashville location. Post if you register for Nashville and hopefully we can connect while there. Stay tuned as I begin blogging again. I will be updating and cleaning up this blog through the rest of this week and weekend. I'm really looking forward to touching base with other homeschoolers again. We've had some major changes in our life in the last year so I've got lots to tell you and tell you what I've learned through all these changes. Welcome back to Ancient Paths. I'm so glad you stopped by. Be sure and subscribe to get all the new updates. Check back in 6 weeks! Prayer Focus - Spend some time today praying for our local law enforcement, firefighters, military and hospitals. Pray that God would protect them and give them wisdom in the midst of very difficult circumstances and situations. What Was That Thing She Talked About Last Year? Heart of Dakota Box Day!